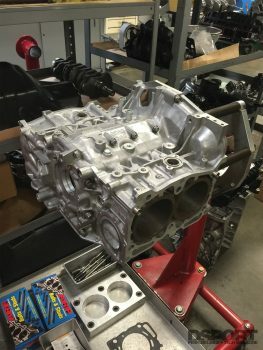 While the quality of Subaru’s production line machine work may be adequate for an EJ257 engine to live a long life at factory power levels, there are few EJ257s that will spend their lifetime at factory power levels. At elevated power levels, it’s common that the OEM’s slight misalignment of the crankshaft centerline becomes a problem. This misalignment places stress and strain on the main bearing housings that leads to distortion in the main bearing bores. This is especially common in the main bearing bores that are thinner than the rest as these see the highest loads. Once the distortion of the main bearing bores gets to a certain level, the block can be rendered unusable. Initially the fix was to start with a new block and replace it each time the engine was rebuilt. 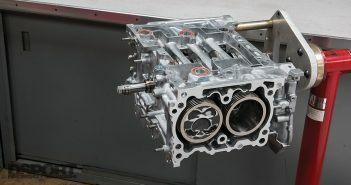 A few top-notch machine shops were able to save some of these blocks through a tedious machining process, but many were discarded. 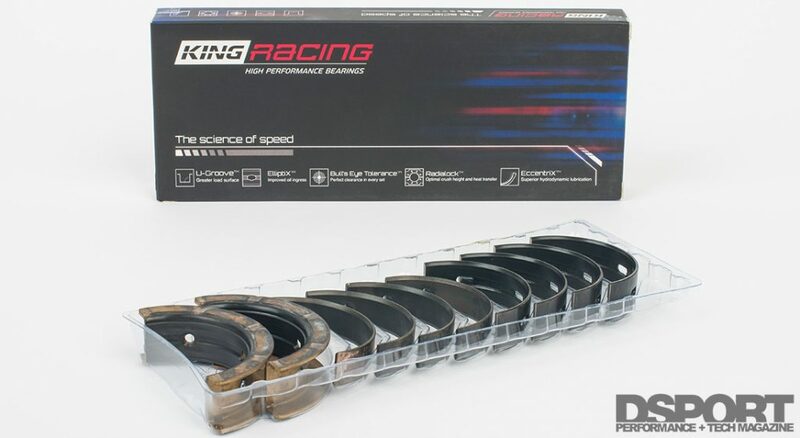 Now, King Racing offers special bearing sets with oversized outside diameters for the Subaru EJ257 engine. 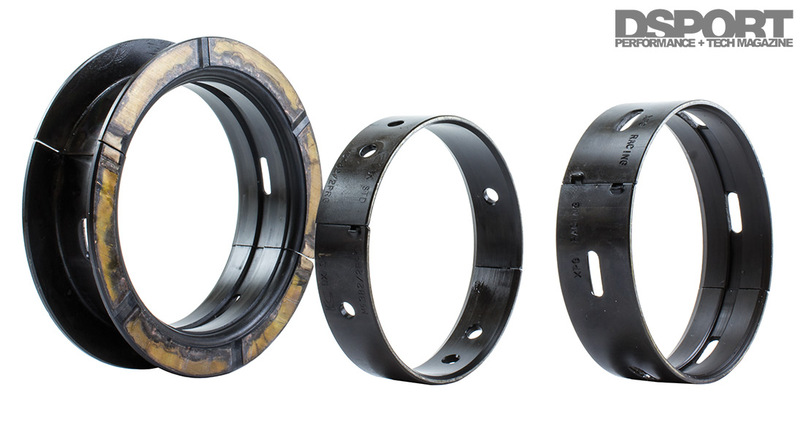 These special bearing sets dramatically cut down the time it takes to correct or repair the main bore of the block. If you own a Subaru EJ257 block, there’s about a 99-percent chance that the main bearing bore alignment of your block is out of whack. As a result, your crankshaft is likely pitched to the left, right, top or bottom of the centerline that it should be on. The degree of this misalignment varies, but it’s entirely possible to have two diagonally opposed pistons sitting as much as 0.006” apart. One piston might be +0.002” (above the deck) while another might be -0.004” (below the deck). This misalignment causes a larger variance in cylinder-to-cylinder compression ratios. As a result, one cylinder may tend to detonate much earlier than the rest, limiting power output and jeopardizing reliability. In addition, the misalignment can lead to unbalanced loads being placed on the main bearings. For peak performance and reliability from any EJ257, it’s imperative to have the main bearing bore alignment as straight as possible with none of the main bearing bores more than 10 microns off center. 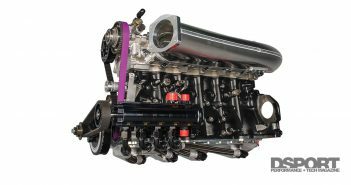 When higher-horsepower “built” EJ257s employ aftermarket high-performance case bolts that increase the clamping force on the cases, the main bearing housing bore will distort and become out of round. In some cases, the distortion is minimal. In other cases, the distortion and degree of out of roundness can lead to uneven main bearing wear, overloading of the bearing material or even bearing failure due to insufficient lubrication. Since few of the Subaru engine builders in the aftermarket have any engineering or scientific background, the reasons for these failures are often blamed on the wrong factors. As stated before, achieving the highest degree of straightness to the main bearing bore will benefit performance and durability. 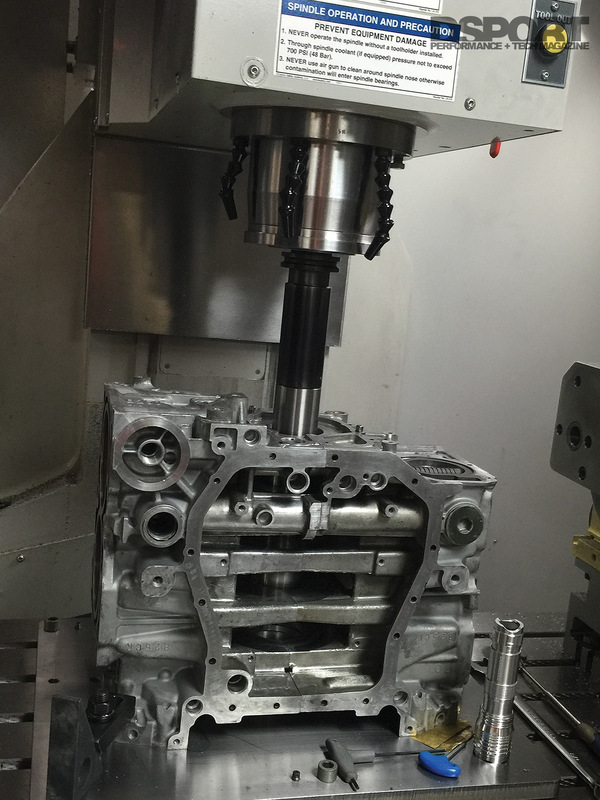 To correct the main bearing housing alignment, roundness and dimensional issues; a few of the higher level machine shops in the country began to do a vertical CNC line boring operation. At Club DSPORT, we would start by removing 0.001~0.002” of material from each of the case halves depending on the initial flatness of the case halves and the existing main bore dimensions. Of course, it’s imperative to check the main bearing bore dimensions using the case bolts that will be used on final assembly (OEM or ARP) with the case torqued to final spec. Measuring both case halves for flatness and setting up both case halves in the CNC mill to remove the minimal amount of material could take anywhere from one to three hours. Once the machining of the case halves was completed, the halves would be removed from the CNC machine and bolted together while a special vertical line boring fixture is placed into the CNC machine. This process takes 30-to-45 minutes to complete. 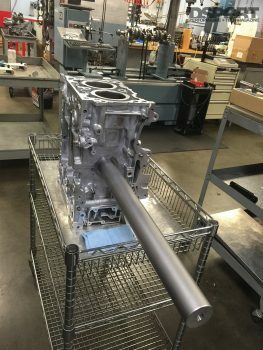 With the vertical line boring fixture set up in the CNC machine and the EJ257’s freshly-machined case halves bolted together to the final torque spec, it takes anywhere from one to three hours to get the block in alignment within 10 microns from the top to the bottom main bearing bore. Once aligned, the use of an optical tool setter and special custom PCD cutters allows the bores to be cut in two to three passes in under an hour. For the most part, the average time to complete this operation is eight hours and it requires an experienced machinist capable of delivering high precision results. As a result, this process can easily run $600 to $800. While the cost may seem high, the results are extremely impressive. There would be a slight loss of deck height (0.002”), but the main bearing housings would be on center to within 5 microns (0.0002”) while also being sized within 5 microns (0.0002”) of each other. The dimension was always targeted to be at the minimal recommended bore size from the OEM to provide the maximum amount of bearing crush for maximum performance. The reality is that there are very few machine shops in the country that can turn out the level of work produced at Club DSPORT. It’s not just about the machinery or the skill level of the operators, it also comes down to what a customer is willing to pay. It takes time to achieve the highest level of precision possible and time costs money. Unfortunately, not everyone has the money. Fortunately, King Racing now offers EJ257 main bearings with oversized outside diameters to significantly cut down the time required and reduce the level of precision needed to correct the main bore housing on an EJ257 block. King Racing offers its O.O.D. (Oversized Outside Diameter) bearings in two oversizes. There is a +0.002” bearing set (MB5739XPG OD+.002”) and a +0.005” (MB5740XPG OD+.005”) bearing set. The +.002” set is ideal for high-precision machine shops looking to perform the main line bore correction on new or slightly used EJ257 blocks using OEM or aftermarket case fasteners. The +.005” set is ideal for standard high-performance machine shops looking to perform the main line bore correction on new or possibly-abused EJ257 blocks using OEM or aftermarket case fasteners. Since either of these sets allow the main bore to be increased from its OEM sizing, there is no need to machine the case halves. This saves a valuable amount of time. Since the +.002” oversized OD set only requires the setup to be just under 0.001” (under 40 microns), it can dramatically reduce the time it takes to get the block ready for the line boring operation. In addition, the larger +.005” oversized OD requires even less time as the block alignment can be half as precise and still deliver the same results. At the end of the day, the time and cost of the line boring operation can be cut by 40-to-50 percent in most cases. What used to take a full eight-hour day can often be completed in four to five hours. The factory finished machining of the EJ257 engine block (case) leaves a lot to be desired. The primary issue is the main bearing housings in relationship to the rest of the case. Ideally, these main bearing housings should not only be correct in dimension, but must also be correct in position. Correcting this issue requires a lot of time and a high degree of precision if standard OD main bearings are to be used. Using the King Racing oversized OD bearings reduces the level of precision and the time required to make the fix. Using the King Racing oversized OD bearings and performing a main bearing bore correction ensures that your EJ257 has the first two cards of a royal straight. A straight crankshaft, proper machining of the deck surfaces and bores and the selection of the proper components make up the rest of the high-performance hand that can’t be beat.